Aug. 08, 2015 + + + In intelligent power supply networks – smart grids – the quality of data transmission from digital meters to the power supply company is playing an increasingly important role. To make sure data is smoothly transmitted via lines in the power grid, it must be ensured that this transmission is also possible with equipment and transmission systems from different manufacturers. Siemens has developed the CX1 data transport profile for this purpose, and it is well on its way to becoming the international standard for open, secure, and fault-tolerant data communication via powerline for smart metering in intelligent power supply grids. 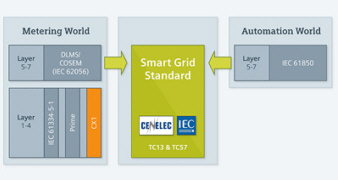 The European Committee for Electrotechnical Standardization, CEN/CENELEC, has completed the standardization process with the publication of the CX1 standardization documents CLC/TS 50590 and CLC/TS 52056-8-7. With this step, Siemens has positioned CX1 as the universal international standard for powerline communication (PLC) that can be used independently of frequency band in medium and low-voltage networks. "With the positioning of our CX1 standard, we are pursuing the goal of supporting the rapid introduction of smart metering technologies in smart grids based on a reliable, economical transmission technology," said Thomas Zimmermann, CEO of the Siemens Smart Grid Solutions & Services Business Unit. Intelligent power supply grids, also referred to as smart grids, are designed to increase efficiency and to compensate for the highly fluctuating power that is fed from solar, wind, and biogas plants into the existing power supply networks. To accomplish this, a large number of sensors and actuators must be installed in the supply networks and linked using communication technology. Along with grid sensors that are installed in the grid to record grid status data, smart meters can be used as information and communication gateways in households. In addition to recording energy consumption data, the devices also collect information about network quality and then relay the information to the utility company's energy management system. This data can then be used to control the power supply grid. Distribution line carrier communication protocols (DLC) such as Siemens CX1 use the existing power lines to transmit information relating to consumption and the grid. For economic reasons, many utility companies choose to use DLC communication protocols to save the additional investment costs associated with providing an additional communications infrastructure. Developed by Siemens in Austria, CX1 is a communications protocol that is based on spread spectrum modulation, in which multiple frequencies within the same frequency band are used simultaneously to transmit a single signal. This means that interference, which often occurs at certain frequencies, has only a negligible effect on signal transmission. In addition, through automatic routing of the communications links, the communications protocol can handle any change in the physical communication parameters of a low-voltage power supply grid, such as signal attenuation, noise, network disruption and signal coupling, as well as operational changes in network configuration. No engineering of the communication network is required for CX1, and the protocol offers ample scope for the integration of additional transmission protocols as well as of future smart grid functions, such as the secure transmission of control signals. Furthermore, it can be integrated into existing IEC-protocol-based network automation and energy management infrastructures. Siemens has implemented the CX1 standard in AMIS, a smart metering solution that is currently being rolled out nationwide by a large Austrian distribution system operator. In what is currently the largest CX1 installation worldwide, more than 150,000 end devices have already been installed in households. Thanks to the extremely high communications availability, the recorded smart metering measurement values are transferred to the control center with an extremely high degree of fulfillment. CX1 is the latest generation DLC communications protocol and is already being used in numerous projects.